Climate Question: Do We Get to Keep Flying? An analysis of jet fuel alternatives that could be viable in the next decade. 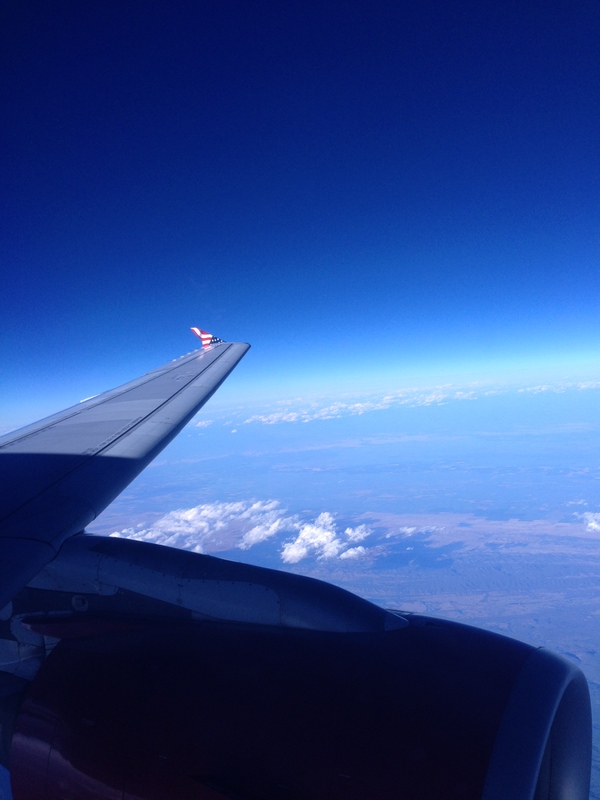 WHAT: A feasibility study of alternatives to conventional jet fuel for aircraft. Last week, I looked at how our transport systems could be carbon free by 2100 and was intrigued by the comment ‘hydro-processed renewable jet fuel made from plant oils or animal fats is likely to be the only biomass-based fuel that could be used as a pure fuel for aviation, but would require various additives in order to be viable as an aviation fuel’. It made me wonder what was being done for airplane fuel alternatives, or do we not have any alternatives and will I have to give up visiting my family in Australia? I came across this technical report by MIT and the RAND Corporation (apparently RAND stands for Research ANd Development) and sat down to read all 150pages (you’re welcome) and see what our options for fuels that we could feasibly use in the next decade are. The paper compared alternative fuels on the basis of compatibility with existing aircraft and infrastructure, production potential, production costs, lifecycle Greenhouse Gas (GHG) emissions, air quality emissions, merit of the fuel as jet fuel vs ground fuel and the maturity of the technology. The researchers pointed out (quite rightly) that emissions from biofuels need to take into account the carbon emitted through land use changes because if you clear-fell a forest to plant a biofuel crop any carbon you’ve saved by not burning oil has just been invalidated by the carbon emitted from clear-felling the forest. The standard fuel used in North America for aviation is called Jet A and was used as the benchmark for the study. So what did they find? Almost all Jet A fuel comes from crude oil and is kerosene based. 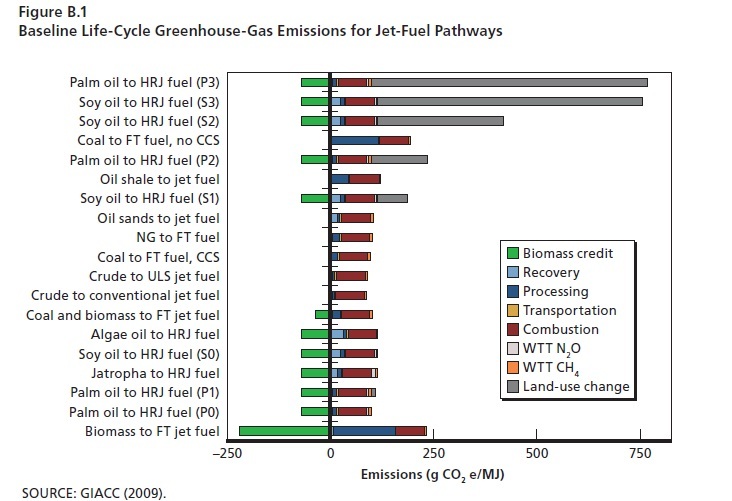 The emissions from Jet A are 87.5g of CO2e (CO2 equivalent) per megajoule (MJ) of energy created (g CO2e/MJ). Of that 87.5g, 73.2g comes from the burning of the fuel and there can be a 7% variation on the amount emitted from refining depending on the quality of the crude oil used and the refining process. The world consumption of jet fuel is estimated at 5million barrels per day of oil. This number is really hard to wrap your head around, so let me quickly walk you through some math. A barrel of oil is 159L, which means 5million barrels per day is 795,000,000L of oil burned each day. To get that volume of water, you would have to run a fire hose (359L/minute) for 101 years (yes, YEARS). We burn that much in one day. Given that a conventional fuel is already oil based and you can’t reduce those carbon emissions, the tweak for this paper was an Ultra Low Sulfur Jet A fuel, which would reduce sulfur emissions from burning the fuel. While it’s a great to reduce sulfur emissions that cause acid rain, the extra refining needed upped the lifecycle emissions to 89g CO2e/MJ. Unconventional fuels are things like the Canadian tar sands (or oil sands if you’re their PR people) and Venezuelan Heavy Oil. These oils are dirtier and require more refining to be made into jet fuel. They also require more effort to get out of the ground, and so the lifecycle emissions are 103g CO2e/MJ (with an uncertainty of 5%). The upstream emissions of sourcing and refining the fuel are what add the extra – burning the fuel has the same emissions as Jet A, and the upstream emissions range from 16g CO2e/MJ for open cut mining to 26g CO2e/MJ for in-situ mining. You can also get shale oil through the process of fracking and refine it to Jet A. Shale based Jet A also burns the same as Jet A, but the extraction emissions are a whopping 41g CO2e/MJ which is double the tar sands extraction emissions, giving an overall 114.2g CO2e/MJ lifecycle emissions. These are fuels derived through the catalysed Fisher-Tropsch process and then refined into a fuel. These fuels are good because they have almost zero sulfur content (and therefore almost zero sulfur emissions). They don’t work as a 100% fuel without an engine refit because of the different aromatic hydrocarbon content, and the energy density is 3% less than Jet A (meaning you’d need 3% more fuel in the tank to go the same distance as Jet A fuel). However, it does combine easily to make a 50/50 blend for planes. You can make FT Synthetic fuel from natural gas which gives you 101g CO2e/MJ emissions, from coal which gives you between 120-195g CO2e/MJ and relies on carbon capture and storage as a technical fix, or from biomass, which has almost zero lifecycle emissions ONLY if you use a waste product as the source and don’t contribute to further land use changes. These are biodiesel or biokerosene which can be made from soybean oil, canola oil, palm oil, coconut oil, animal fats, waste products or halophytes and algae. Because this paper was looking at fuels that could be commercially used in the next 10 years, they looked at a 5% blend with Jet A fuel to meet freeze point requirements (most renewable oils freeze at too high a temperature for the altitude planes fly at). They found too many safety and freezing point issues with biodiesel or biokerosene, so didn’t calculate the emissions from them as they’re not practical for use. Another renewable oil is Hydroprocessed Jet Fuel entertainingly sometimes called ‘Syntroleum’. This is made from plant oils, animal fats or waste grease. Soybean oil without land use emissions would have only 40-80% of the emissions of Jet A, while palm oil would have 30-40% the emissions of Jet A. The paper looked at using ethanol (the alcohol we drink) and butanol as replacement fuels. They both had lower energy densities to Jet A, higher volatility (being flammable and explosive) and issues with freezing at cruising altitude. While butanol is slightly safer to use as a jet fuel than ethanol, the report suggests it’s better used as a ground transport fuel than a jet fuel (I assume the better use of ethanol as a drink is implied). They recommended that when looking to reduce the emissions from the transport sector that aviation shouldn’t be treated any differently. While strongly recommending that land use changes be taken into account for the use of biofuels, they also pointed out that the use for aviation should also be looked at as limited biofuel resources may be more effective producing heat and power rather than being used for transport. Personally, I don’t find the report very heartening given that the first two options involve either dirtier oil or really dirty coal when what we need to be doing is reducing our emissions, not changing the form they’re in and still burning them. I’ll be keeping my eye out for any new research into hydroprocessed renewable jet fuels that could use waste products or algae – given the speed that oceans are acidifying, there could be a lot of ocean deadzones that are really good at growing algae and could be used as a jet fuel. But until then, it looks like there aren’t many options for the continuation of air travel once we start seriously reducing our emissions – they’ll be a really quick way to burn through our remaining carbon budget.